The whole Section 36 of Nigeria Constitution dwelt on human dignity, the right to life of every Nigerian, provided that if any life must be taken, it must be upon sentence or conviction by a competent court of law. In the same vein, the relevant chapter of the United Nation also respect the right of person to life. In the Holy book of the Bible, particularly Exodus 20 verse 13, it says 'thou shall not kill'. In some developed countries, individuals and government, have come out to publicly denounce death as maximum sentence on convicted criminals. They are now allowed opportunity to live life in confinement. Some are even made to engage in community service. However, in Nigeria, where impunity is the order of the day, group of persons or individual do certain things and get away with it. Some people even execute judgement without recourse to the law court, most times, they get away with it. For example, at a shout of thief and you happen to run, people who would be referred to as 'mob' could just descend on you and the unlucky man is set on fire. Lynched. What a barbaric life! And the Nigerian law enforcement agents, especially the police force, always arrived the scene hours after the did has been done. This is how lives of four students of the University of Port Harcourt named Ugonna, Ilyod, Tekana and Chidiaka were brutally beaten and burnt alive by indigenes of Aluu community for allegedly stealing phones and laptops in an off campus hostel. No trial, no fair hearing, but the judgement of primitive men hungry for blood, sent the young undergraduates to their early graves. The angry mob as reported, put tyres over the heads of these students who were reportedly not armed and burnt them to death. They even took photos of the barbaric act, filmed it and spread them around. Whatever happened to calling the police and getting them arrested? It think, it's time we civilized. I hope the Nigeria law enforcement will do all to bring these terrible and barbaric 'mob' to book. From the video available, these evil people can be identified. Finally, this evil act was allegedly done by a group of person in Omokere-Aluu community in Choba area of Rivers State . I am therefore calling on Governor Amechi of River State and the President of Nigeria to fish out the perpetrators of this jungle justice. If the killers cannot be found, the village or community head should be held responsible. Government must take steps with action to address this injustice. Arbitrary killing of people at the slightest opportunity must stop in Nigeria. we are not animals, we should not continue to live like barbarians. 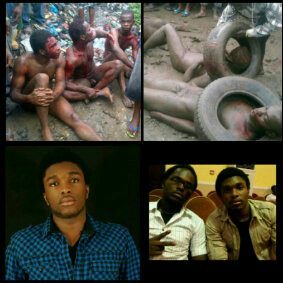 So lets join the onging campaign #justiceforAluu4 until the perpetrators of this dastardly act are brought to book.